Kristina Rihanoff has said Nicole Scherzinger would be a good replacement for Dame Darcey Bussell on the Strictly Come Dancing judging panel. Dame Darcey announced last week she would be leaving the BBC One series after a seven-year stint as a judge. The former ballerina said she would be focusing on “other dance commitments” and added that her departure was not due to “any upset or disagreement”. 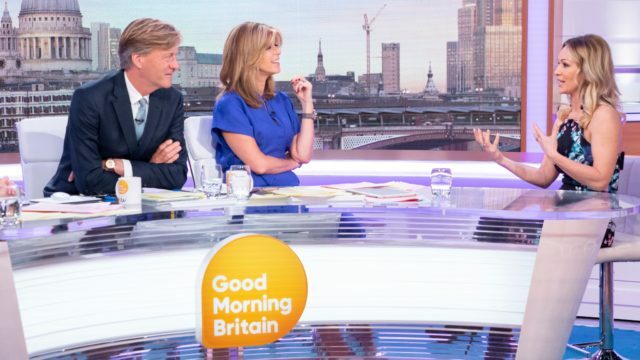 Kristina Rihanoff talks to Richard Madeley and Kate Garraway on GMB (REX). Among the names she mentioned were American choreographer Mandy Moore, known for her work on the 2016 film La La Land, and also for working on American dancing shows So You Think You Can Dance and Dancing With The Stars. The 41-year-old also commented on the so-called ‘Strictly curse’, following reports of a romance between 2018 winner Stacey Dooley and her professional partner Kevin Clifton. Rihanoff was previously in a relationship with her 2009 Strictly celebrity partner, boxer Joe Calzaghe, and is currently dating rugby player Ben Cohen, who she partnered on Strictly in 2013.